The Filer : The multi-layers filter can stop and reverse the toxic smoke in fire not easy to break though directly, and the toxic smoke to be purified by the elaborative construction filter. Shelf life : 4 years packed in the aluminum package. The Hood : The transparent film can resist high temperature up to 500°C, it is designed to fit the face with 360°C full angle of view, can speech and hearing when put on the hood. The Neck Strap : The neck portion made of fire resist material, it has an excellent elasticity and stretches, block the smoke from outside. One size filling adults, children and infants. The Award is organized by the Japan Industrial Design Promotion Organization (JIDPO), It ranks as one of the world's top three industrial design award and the most recognized certification of quality, practicality and design in Asia. 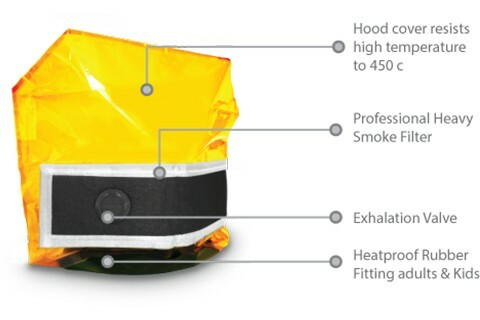 MapleLeaf Smoke Hood is a small, portable, heat resistant with efficiency filter that can protect you against toxic smoke from fire. The full face mask can be easily and quickly put on let you escape from fire without delay. Safety is everything, you should be prepare a Pocket Smoke Hood. The Hood small, less 50gsm light weight and palm size, easy to place it in desk drawer, briefcase or handbag, so you can take it anywhere to protect you at anytime. Just open packaging and put on the hood over your hand, only 3 steps in 15 seconds, no training need, no extra parts need, let you emergency escape from fire immediately. The Facial conforming hood covers entire head including eyes, nose and mouth. The flexible rubber neck strap provides very fit sealing for adults, children and infants. The multi-layer active carbon filters can absorb toxic particles and filtering harmful smoke during in a fire situation. The extra large filter provides enough air flow for breath easily.